I'm not sure why, but for many years I didn't want to be on DeviantART. Something about it didn't appeal to me. I think it just seemed too "big." As in, the Microsoft of online art communities. Toeng seemed much better at the time, and when that went under I switched to Minitokyo. But DA has been around for a very very long time, and it's become the most successful online art community of them all. In recent months I wanted to reconnect with the old toengers. Currently I'm working on some art research, and a few artists I had to contact also had nothing by DA pages. So it would seem that me getting a DA account was primarily due to wanting to communicate with specific individuals. I suppose it's just as well. After all, it can't hurt to broaden my online presence. 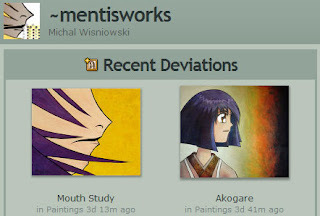 So if you want to see my DeviantART page, just go on over to mentisworks.deviantart.com and say hello.